We offer a wide range of courses. All our courses offer you qualified teacher status. *Assessment Only is suitable for those who are currently employed as unqualified teachers or have teaching qualifications from abroad. Additionally you can specialise in SEND, PE, Behaviour or Primary Mathematics. Provider-Led is a fee paying route provided by a SCITT (School Centred Initial Teacher Training), a partnership of schools offering training. This is a fee paying route provided by schools, working in partnership with a SCITT or University. This is a ‘hands on’ training route supported by excellent theoretical training. You will need a 2.2 honours degree, at least a ‘C’ or level 4 grade at GCSE in English, Maths and Science and have passed your skills tests in English and Maths. If you are accepted into this route, we will place you in two partnership schools during the year in different key stages. The fees for this route are £9,250 inclusive of your university fee. If eligible, you can apply for a Student Loan or self fund. Read more on your options on our finance page. School Direct Salaried is offered by schools, working in partnership with a SCITT or University. On this route your fee is paid by your employing school and you will receive a salary on the unqualified teachers’ pay scale for the duration of your training. Several of our schools offer salaried places each year. All are keen to find high quality trainees and invest in your school direct training with the promise of a job in the school at the end of the training if an appropriate position becomes available. If you apply to this route and do not then secure a school to offer you a school direct salaried position, we always offer the training route place as an alternative. Is the training different on these routes? No. All salaried and training route trainees benefit from 120+ days in school and the 70+ days of centre-based training and will attend lectures together. If you are currently working as an unqualified graduate teacher in a primary school, you may be able to gain Qualified Teacher Status via the Assessment Only route into teaching. Becoming a qualified teacher holds many benefits, including the certainty of moving up the pay scale and greater, more flexible opportunities over where you can work. 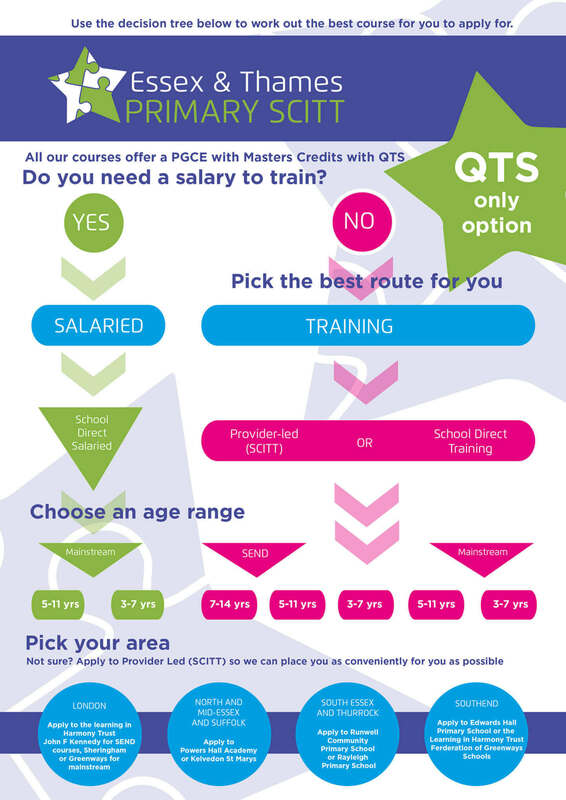 Do you qualify for the Assessment Only QTS Route? The Assessment Only route to QTS has been designed specifically for those graduates who can demonstrate that they already meet all the standards required for Qualified Teacher Status and therefore would not need to spend a year training to be a teacher on a conventional teacher training course. You must have taught in at least two schools or Early Years settings, across the whole age range choosing from ages 3-7, 5-11 or7-14. You must have C-Grade or level 4 or above in English, Maths and Science GCSE (or equivalent). Please Note: It is unlikely that you will have gained sufficient experience if you have not been employed for two years as an unqualified teacher, but teaching in schools outside the UK and teaching as part of a recognised training course may be acceptable. The benefit of this route is that you can bee assessed during your regular working day. What is the cost of Assessment Only QTS? The cost of qualifying as a teacher through the Assessment only route to QTS is £2,540, payable before the first visit. Additional costs may apply if you are a teacher working abroad who requires an assessment team to travel to carry out an assessment in your home setting, and travel costs might apply if you work in a school a long distance away from the SCITT. We will, of course, try our best to minimise any such costs. When could you start the Assessment Period? At any time during the year! We are happy to discuss the possibility of any start date with you when you apply. What will happen once you have gained QTS? You will enter the first year Newly Qualified Teacher (NQT) Induction period. How do I apply for the Assessment Only Route into Teaching? If you would like to apply for the Assessment Only QTS route, you can apply directly to us by clicking below to complete and submit our assessment application form.